Q & A period will follow the screening. 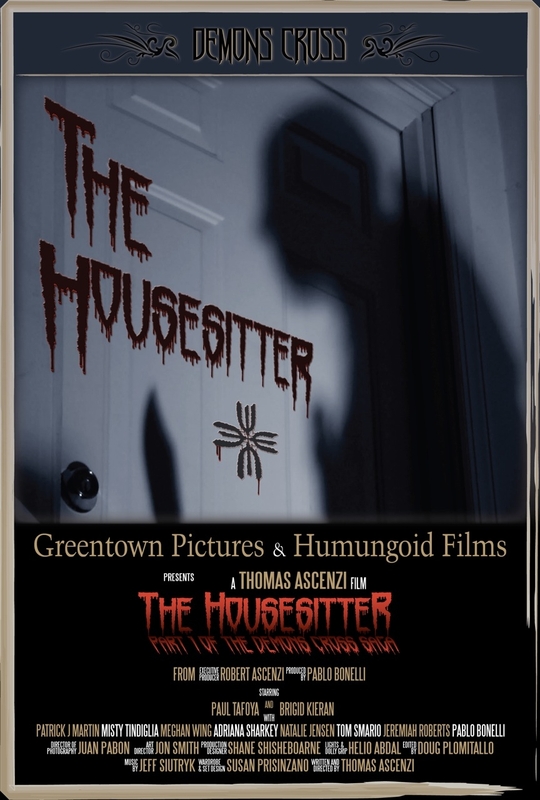 This local production company will be screening it most recent production, “The Housesitter”. The Demons Cross Saga is the story of a struggle between two covert and ruthless powers. The Housesitter is the first installment of the saga. “The Trust”, an elite secret society emanating from within a prestigious New England university and El Jefe, the shadowy figure behind Mexico’s most powerful drug cartel. While power behind The Trust may be older and reach further, El Jefe has one important element on his side. His enemies know less about him than he does about them. The central character Susan is from a family steeped in the traditions of The Trust, a tradition she rejects. However, spite of her scorn however she and her friends are not safe from the crossfire of this clandestine war. What was meant to be a bucolic weekend in the country turns into a bloody nightmare for five friends as they are stalked and terrorized by a monstrous killer. Matthew is an artist, activist and community organizer based in the Hudson Valley. His work is based in a social practice that looks to create public forms of culture. Seeing himself in hybrid roles, he works with communities to explore the wealth of social knowledge that is held in a place, then expressing it through forms of visual and interactive media. His work includes the Hyde Park Visual History Project, Walking History, The Powers that Be, and Freespace. In 2010 he began PAUSE, a non profit organization that uses art as a catalyst for community engagement and development. The Dead Hare Radio Hour is broadcast every Tuesday at 5pm (EDT) on 91.3 WVKR, Poughkeepsie, NY. The show can be streamed on the WVKR website. Download Episodes of The Dead Hare Radio Hour via iTunes. “Art in the Twenty-First Century” Season Six includes 13 profiles of artists from five continents gathered into four, one-hour thematic episodes: Change, Balance, History and Boundaries. Spanning the globe from Nigeria to New York City, from Beijing to Brazil, the programs reveal the artists at work and speaking in their own words as they demonstrate the power of art to alter perception, challenge convention, and change how we see the world around us. This episode features artists who bear witness, through their work, to transformation – cultural, material, and aesthetic – and actively engage communities as collaborators and subjects. Ai Weiwei, El Anatsui, and Catherine Opie are featured. This 3-hour workshop is ideal for those qwho want to learn to create ePub documents from InDesign. The electronic book format that has become the industry standard, allowing eBooks that use this format to be read on a wide variety of eReaders, from dedicated hardware to desktop software to online based readers like the Kindle, the Nook and iPad. For nearly 20 years, Michael Murphy has been a hands-on designer and art director, crossing the line between design, production and software training throughout his career. Michael is an Adobe Certified Expert in InDesign CS5, and the author of “Adobe InDesign CS4 Styles: How to Create Better, Faster Text and Layouts” (Adobe Press, 2009). He is also a contributing writer for InDesign magazine, and a featured speaker at the InDesign Conference and several InDesign User Groups.